This chapter introduces “next-generation” methods for radiofluorination reactions with fluorine-18. We will primarily focus on two topics: (1) methods for the 18F-fluorination of heteroatoms and (2) methods for the transition metal-mediated 18F-fluorination of aromatic and allylic carbons. Fluorine forms bonds with several group 13–15 elements, including carbon (obviously), boron, nitrogen, aluminum, silicon, and phosphorous. For example, [18F]fluoride and aluminum form a stable [18F][AlF]2+ complex which can be incorporated into biomolecular targeting vectors using bifunctional chelators such as NOTA and NODA. With boron, [18F]fluoride readily forms organotrifluoroborate salts which can be synthesized using boronic esters in finely controlled carrier-added conditions or via 18F–19F isotopic exchange from trifluoroborate salts of the stable isotope. 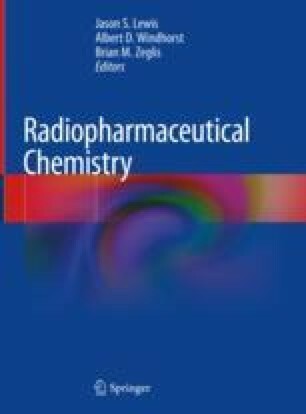 Both methods can be utilized for the synthesis of 18F-labeled radiopharmaceuticals with high radiochemical yields (RCYs) and high molar activities (GBq/μmol). Shifting gears a bit, transition metals can be used to catalyze the 18F-fluorination of sp2 carbons at aromatic and allylic positions using nucleophilic [18F]fluoride. Selective fluorinations of these positions have been notoriously challenging using conventional radiosynthetic methods, especially when products with high molar activity are needed (see the chapters on “ The Radiopharmaceutical Chemistry of Fluorine-18: Nucleophilic Fluorinations” and “ The Radiopharmaceutical Chemistry of Fluorine-18: Electrophilic Fluorinations”). Yet novel methods based on palladium- and nickel-aryl complexes as well as copper(II) salts have revolutionized this area, providing access to a wide variety of 18F-fluorinated aromatic and allylic substrates in moderate to high yields and formerly unattainable molar activities (GBq/μmol).